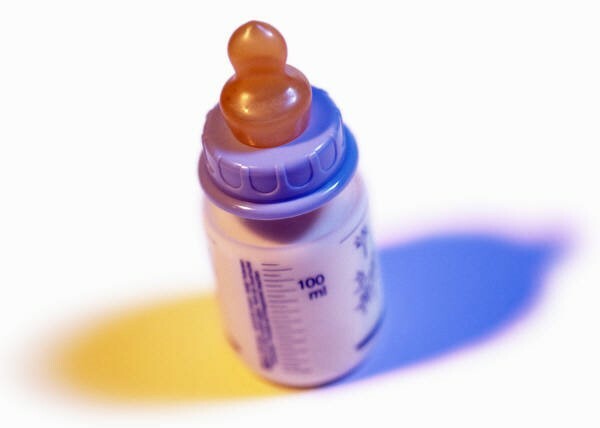 Without diving into a debate about breastfeeding vs. formula feeding (other posts cover some of my thoughts on this topic: Judgements: Breastfeeding vs. Formula Feeding and Encouraging Breastfeeding: How Far is Too Far? ), suffice it to say that I have always had to supplement. I was very proud that with baby #2 I was able to provide about 75% of his sustenance through breast milk through 9 months; however that means that I was still relying on formula for the remaining 25% and 3 months of the first year. As such, it has always been critical to me to find the highest quality and most natural formula and supplements that I could. And I was thrilled when after months of trial and error with baby #1, I finally found Nature’s One Baby’s Only Organic LactoRelief formula (try saying that 10 times quickly) paired with their DHA & ARA Fatty Acid supplement. Finally something checked all the boxes: organic, natural (as possible), lactose free for sensitive tummies, and a DHA/ARA supplement that is egg derived via a water process – instead of being derived from algae and fungus and treated with hexane solvent, acid, and bleach (like the DHA/ARA found in all other commercially available infant formulas). In fact, I was so pleased with the DHA/ARA supplement by Nature’s One that I continued to order it long after my eldest was off the bottle; I continue to give it to him to this day, mixed with his milk or yogurt. Unfortunately, due to low demand and rising packaging/ingredient costs, Baby’s Only Essentials DHA & ARA Supplement will not be available for purchase going forward. Nature’s One made this difficult decision so that we can continue to focus our efforts on providing the best products possible while maintaining competitive prices. That means that after our last two boxes, I am out – and will need a replacement as I definitely still want to supplement DHA for both children. Fortunately, it appears that all Nature’s Only infant formulas remain in production; most notably, the Dairy formulation which includes their water-processed DHA/ARA. Unfortunately, their LactoRelief formulation does not, at the moment, offer an option inclusive of DHA/ARA – so that leaves me trying to find an alternative. After some research, I plan to switch to Nordic Naturals Children’s DHA Liquid. I had always been reluctant to use cod liver oil due to concerns with mercury, so had previously steered away. But in researching Nordic Naturals, I found that they surpass international standards for levels of mercury (< 0.1 ppm). They additionally surpass international standards for other worrisome heavy metals such as lead, arsenic, and cadmium. PCBs are concerning as well – and fortunately this product surpasses international standards (including standards under California’s Prop 65). Most comforting is the fact that these statements are backed by third party – not Nordic Naturals – analysis. But how are the fish sourced? I was pleasantly surprised here as well. Nordic Naturals maintains that their Arctic cod is wild-caught from Norwegian waters. Furthermore, that their fishing practices align with the Norwegian fisheries management system to prevent overfishing; that they use responsible fishing gear to prevent the unintentional capture of other species; and that they use regulated line and net fishing methods to prevent damage to the seafloor and ecosystem. I did have one final thought pop into my head that I wasn’t sure would be addressed on their site… And that was if there were ANY fish sourced from areas that may be impacted by the Fukushima nuclear power plant situation. Lo and behold, Nordic Naturals does address this! They indicate that since the initial incident in March 2011, they have been proactively testing their fish oil for any indication of radiation. To date, they have never had a detectable result. I placed my first order this morning. To be fair, it is definitely not the least expensive option. Today’s discounted price was $37.41 for a 16-oz bottle on Amazon. BUT the responsibility of this company along with their commitment to carefully testing, researching, and analyzing their products gives me the peace of mind necessary to make the purchase worth it. The final test will be the taste. I plan to hide it in milk, yogurt, or other “mushy” foods… But my two little critics will be the ultimate judge. Will keep this post updated. Once it became clear that I wouldn’t be breastfeeding (see previous post), I set out to find the absolute best formula that I could for my son. Not an easy feat, I soon learned. Between researching the best ingredients, latest studies, and what simply suited my son, we went through quite a while of formula roulette – hoping that one would finally stick. In the hospital, he was given Enfamil Premium Newborn. This is a milk-based formula with extra Vitamin D. Since I had nothing to compare it to, it seemed adequate. After a few feedings, he began spitting up a little bit. A nurse immediately “diagnosed” him as lactose intolerant or milk-sensitive and switched his formula. Enter Enfamil Prosobee. This is a soy-based formula (therefore milk and lactose-free) with included DHA/ARA. This formula actually worked well for some time. My son tolerated it and his bowel movements were regular. He thrived. But then I started doing some research on soy infant formula. I had seen an article about potential concerns with soy in formula, so began to dig a bit deeper. And what I saw scared me. First of all, it’s recommended that preemies not be given soy formula. Hmm… That raised a bit of a red flag for me. Then I started reading about phytoestrogens (chemicals structured similarly to estrogen) that are find in high levels in soy. Apparently with the concentrated level of phytoestrogens included in formula, it may be the equivalent of an infant ingesting 3-5 birth control pills a day! I read about increased risks of thyroid disorders, food allergies, early puberty, reproductive issues, and even cancer as potential effects of high levels of soy in the infant diet. Even the American Academy of Pediatrics (AAP) encourages parents to select milk-based formula as the primary option for feeding. I’m not here to confirm or deny the validity of these claims, but even the fact that these concerns were raised was enough for me. It was time to make another switch. By this time I was becoming a bit more educated about what my child was eating, so had a few new requirements. The formula had to be iron-fortified so as to prevent a deficiency. It also had to include DHA/ARA to help with brain and eye development (most, if not all, do). Furthermore, I was now determined to find a MILK-based formula that would work. Even though the nurse had said that my son was lactose intolerant, I didn’t trust her 2-second diagnosis and figured we would try it again. Now we tried him on the Target brand up & up DHA Milk Based Formula. A quick aside on generic vs. brand name formulas – they are the same! After reviewing the ingredient lists on each, researching, and confirming with my pediatrician, there is no difference between brand name and generic besides price. In fact, many generic formulas are made by the very same manufacturer that makes the brand name formula. Anyways back to Target’s up & up DHA Milk Based Formula. For us, it wasn’t a fit. Our baby soon became excessively fussy during feedings, had much higher incidences of spit-up and vomit, and began experiencing very runny diarrhea. So now I switched him back to what he had started out with, Enfamil Premium Newborn. Sure enough, he continued to experience all the symptoms that the Target brand milk-based formula caused. Hmm…. Maybe the nurse was onto something about him being lactose intolerant or milk-sensitive after all? Another note about switching – The switches have to be tried, at least in my experience, for at least two weeks in order to make a determination. Otherwise the baby has not adjusted yet and it’s just too soon to tell. Also a note about my pediatrician’s advice throughout this journey – basically, there was none other than to try this/try that as we were already doing (interestingly, though, he mentioned and provided samples of only Enfamil formulations – I imagine that’s where the kickbacks were coming from – but that’s another topic). So now I started looking at milk-based alternatives (that’s really all that was left after soy was out the window). It appeared that I could either go the partially or fully hydrolyzed routes. Formulas that are hydrolyzed have proteins that are broken down into smaller pieces for easier digestion. The parent can choose formulations that have either some or all of these proteins broken down. The more proteins that are broken down, the more expensive the formula. In the case of fully hydrolyzed formulas, such as Enfamil Nutramigen or Similac Alimentum, you’re going to be paying significantly more for smaller cans. And, to top it off, the smell and taste definitely leave something to be desired – I personally hated it but I guess you’ve gotta do what you’ve gotta do. So clearly, fully hydrolyzed was our last resort. For now, we went with Enfamil Gentlease, which is partially hydrolyzed. Not only is it partially hydrolyzed, it also contains only about 20% of the lactose inherent in regular milk-based formula. I was really gunning for this one to work – It seemed like a nice compromise and I thought that the lower lactose content would help out as well. My baby had other feelings, however, and it didn’t work out… spit-up, vomiting, and diarrhea continued – along with a new skin rash. Now I was at a loss. I still wasn’t ready to concede to fully hydrolyzed formulas, yet I now began to wonder if my son was indeed truly lactose intolerant or had a milk allergy. So I took him in for a milk allergy test. It was a pretty simple test – A small toothpick-looking thing pricks the baby’s hand. Doesn’t even break the skin. My son didn’t even notice, and the results were back within a few minutes. He did not have a milk allergy. The doctor thought he may just have a lactose sensitivity. Phew… so maybe it’s just a brand thing? I had heard stories of other babies who simply preferred one brand to another. So now I decided to try him on Similac Sensitive. Turns out this brand’s formulation is unique in that it contains NO lactose. Sure enough, we had a winner. Finally! My baby’s fussiness dissipated, spit-ups and vomits slowed down, the rash disappeared, and bowel movements again became regular. I concluded that my son was temporarily sensitive to lactose, as suggested by the doctor, and all was right with the world. Until I read the Cornucopia report on DHA/ARA in infant formula. A friend had sent me information on this before I had even given birth but, with everything else going on, I promptly filed and forgot about it. Now that I had learned so much about infant formula, I remembered it and searched back through my email until I could find and read it. And what I read worried me. (Ugh – is nothing easy when it comes to formula??) Turns out that the DHA/ARA included in most commercially available infant formulas today is derived from strains of algae. Worse, the oil is then removed using a hexane extraction process. Hexane, as I soon found out, is a toxin made from crude oil. The effects of hexane poisoning can result in nausea, vomiting, dizziness, breathing difficulty, and more seriously, peripheral nervous system failure and muscular atrophy. Although it is asserted that the hexane is completely eliminated through the extraction process, it was too big of a risk to take for me. As much as I hated to change my son’s formula again, I had to find something that did not include this hexane-processed DHA/ARA. The friend who had initially sent me the Cornucopia report was happily using Nature’s One Baby’s Only Organic Dairy Formula. I wasn’t quite ready to put my baby back onto a 100% milk-based formula quite yet being as the lactose-free formulation was working so well for him, so I looked into the company, hoping they had some alternatives. Fortunately, they offer Nature’s One Baby’s Only Organic Lactose-Free Formula. The more I read, the more I liked. This formula is USDA certified organic and does not include hexane-processed DHA/ARA nor corn syrup, and uses 100% BPA-free packaging. Instead of corn syrup, organic brown rice syrup is used. And since I did want the benefits of DHA/ARA (without the hexane), I was pleased to find that they do offer a DHA/ARA supplement that is derived from egg yolk. So as much as I hated to once again switch my son’s formula, I felt it was the right thing to do. And fortunately for everyone, it worked out great. And I felt GOOD about giving him an organic formula. He has now been on it for months with no issues. Growing and thriving. But as I mentioned before, NOTHING is simple when it comes to infant formula. Just when I felt relieved that we had found something that worked for our son, and that I felt good feeding him, the other shoe dropped. Now it was all over the media that infant formulas using brown rice syrup as an ingredient (Baby’s Only Organic is the only brand I know of) contained high levels of arsenic. Arsenic!? In baby formula?? Panic. Turns out that a study performed by Dartmouth researchers identified elevated arsenic levels in foods using brown rice syrup as a sweetener – everything from energy bars to cereal bars to infant formula. Now, it’s important to realize that arsenic is everywhere throughout our environment, the food that we eat, and the water that we drink. But the FDA has only set a maximum threshold for drinking water, at 10 ppb (parts ber billion) and, more recently, fruit juices (remember the apple juice scandal a few years back?) The Dartmouth study apparently was pursued to help convince the FDA to better regulate levels of arsenic in all foods and drinks we ingest. Scary stuff. So I began lurking on the Nature’s One website and Facebook pages to review the conversations and company responses. Of course the camps were divided: those who supported the company and were continuing to use the product until further testing was done, those who were outraged and immediately taking their children in for arsenic testing, and those who were temporarily switching to an alternative brand until further test results were in. Long story short – I ultimately remained with Nature’s One. My son was doing well with it. Parents who had their children tested for arsenic exposure were consistently posting results of non-detection. The brown rice used in the sweetener was grown on organic farms in California which, logically speaking, would naturally have less arsenic than non-organic farms or farms located in other areas of the country where higher levels of arsenic have been identified. And, most importantly, I remained based on subsequent independent testing that placed the levels of arsenic within the company’s formulas well below world standards (as the U.S. has no such standards at the moment). If you’re so inclined, the details can be read here. Also, when weighing all the other options out there, I still feel that a USDA certified organic product free of hexane-derived DHA and other artificial preservatives and chemicals is a better option for my son than the alternatives. So here we are, continuing with the formula, and my son continues to thrive. But unfortunately, there is no right answer. There is simply no “best” formula. It really boils down to what each parent is comfortable with. NOTHING REPLACES BREAST MILK. But, when you have to find an alternative, all you can do is pick what is best for your child… and, as I learned, just because one formula is good for some children doesn’t mean it will work for your own. And just because one formula has ingredients you’re pleased with doesn’t mean that it also won’t have ingredients you’re not. If I had to do it all over again, I would have done all this research BEFORE I had my baby. But I naively thought I would just run down to the local store, stock up on several cans of whatever formula was the most popular, and be done with it. Now I know. So what are you formula-feeding moms feeding your babies? I know there are many more brands out there that I never even tried. Anyone else have to go through the roulette that I did?